Since childhood you’ve been wanting to correct your imperfect teeth, but it never materialized. Now that you’re an adult, you’ve started to feel like it’ll never happen and that you’ve missed your opportunity. This way of thinking is based on your perception of teeth-straightening as the awkward kid with metal brackets and wires in his or her mouth. But your local dentist is here to inform you that the path to straight teeth no longer runs down “Humiliation Boulevard.” There is an amazing new way for you to get the smile of your dreams – Invisalign of Natick. Read on to learn more about the process. Invisalign clear braces are made from BPA-free plastic. The process starts with your dentist taking an impression of your teeth and then sending the results off to a trusted lab so that your custom trays can be fabricated. After they’re ready, you’ll return to your dentist to receive all of your trays and will wear each set for around two weeks before discarding them and inserting the next pair in the sequence. 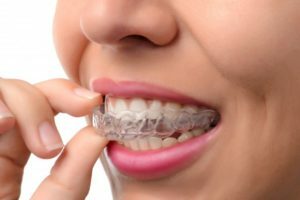 Appealing Look – One of the reasons that you’ve been reluctant to consider braces is that you don’t want to endure cumbersome, bulky parts protruding from your mouth, alerting the world that you’re straightening your teeth. This is also a concern for teenagers who are equally sensitive about their appearances due to peer pressure. But your dentist of Natick says all of these worries can be tossed out of the window with Invisalign clear braces, because they’ll barely be noticeable when you’re wearing them. Easier Maintenance – Another challenge of wearing traditional braces is that they require changes in how you clean your teeth. Since your clear trays are removable, though, you’ll be able to maintain your normal routines for oral hygiene, including brushing and flossing. Lifestyle – If you love popcorn or cheese, you’ll not be able to eat them when wearing regular braces, but with your clear aligners that’s not a factor because they are removed before you eat anything, which means that the process of straightening your teeth doesn’t have to be torturous. Time – Whereas traditional braces can take up to 36 months to correct your smile, in some cases you can cut that time period in half with the Invisalign option, as the process can take 24 months or less. So get off of Humiliation Boulevard and cruise on down Victory Lane with your beautiful new smile. Just reach out to your local cosmetic dentist of Natick to get the process started today! Dr. Christina Papageorgiou received her Bachelor of Science degree in Biology from the University of Michigan and then went to earn her dental degree from the University of Michigan School of Dentistry. She followed that with a General Practice Residency at the University of Illinois, Chicago. A member of the American Dental Association and other professional organizations, Dr. Papageorgiou practices at Papageorgiou Dental Associates and can be reached for more information through her website.